Motley Trio of Livingston Youths Arrested for Organized Crime, LIVINGSTON, March 26, 2019 - On March 6, 2019 at approximately 3:30 am Officers with Livingston Police Department responded to a car burglary that had just occurred in the 1100 block of Timberglen where several vehicles were broken into and property stolen. After the initial report, the investigation continued and one of the victim’s stolen credit cards was found to have been used at several locations in Livingston. After determining these locations and times, security videos were viewed and collected as evidence from these businesses. The videos showed a red Kia Forte occupied with three male suspects. The passenger went inside the business and used one of the victims' stolen credit card without consent and another suspect attempted to use a second stolen credit card at the gas pump. After leaving the business, the suspects went to another location and attempted to use the victim’s stolen credit card at a local ATM. The suspects' vehicle and photographs were placed on social media and were later located and identified. During the investigation, stolen property was found and recovered from the suspects' vehicle and has since been returned back to the owner. Two of the suspects are juveniles, ages 14 & 16, and the third suspect is identified as Micah James Binnion, 17, all of Livingston. The two juvenile suspects were taken into custody and have since been sent to a juvenile detention center. 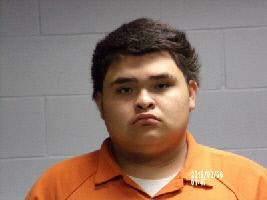 Binnion has been arrested and is currently in the Polk County Jail. All three suspects are being charged with engaging in organized criminal activity (3rd degree felony).